Three compilations of responses to questions about family law given by two prominent Muslim jurists of the ninth century. While western-derived legal codes have superseded Islamic law in many parts of the Muslim world, Islamic, Koran-based law still retains its force in the area of marriage and family relations, the area that is key to the status of women. 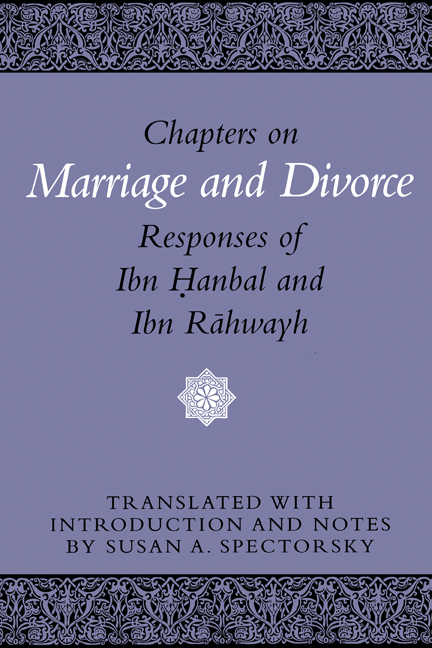 This work makes available for the first time in English three compilations of responses to questions about family law given by two prominent Muslim jurists of the ninth century (third century of Islam)—Ahmad b. Hanbal, the eponymous founder of the Hanbali rite of Sunni Islam (the one dominant in Saudi Arabia), and Ishaq b. Rahwayh. These compilations are basic sources for the study of the development of legal thinking in Islam. The introduction to the translation locates the compilations in a historical context and elucidates how the various issues of family law are treated. An appendix contains a collation of the significant variants among the manuscripts and printed versions of the Arabic texts. The volume concludes with a topical index and an index of names. Susan A. Spectorsky is an associate professor of Arabic at Queens College of the City University of New York.